Another couple of recruits for the Redemptionist gang. These are converted Wargames Foundry flagellants. The first was converted with a new mask and hood, and was given an auto pistol (from the Foundry Street Violence range). 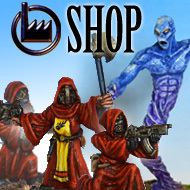 I’ve just had eight new models cast up for the Warfactory range – 3 techno-apes and 5 cultists. They will be going on sale at Lancer next week. These three cultists are variants of the existing models, packing some heavier firepower than their colleagues.